The evil troll has hidden all the treasures of Mark, the Dwarf King. Help King Mark find his treasures. You can't take a treasure if the troll is in the same picture as the treasure. To make the troll go away, you have to make the picture change. Troll's Tale challenges children to locate 16 treasures hidden by the awesome troll. It enhances focus skills (identifying details, making inferences, predicting outcomes, drawing conclusions) and reading skills. 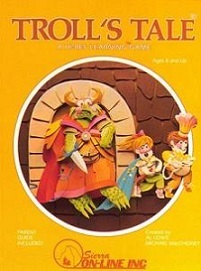 Troll's Tale was the inspiration for The Black Cauldron and is the third game Al Lowe ever programmed. It looks incredibly simplistic now, but as he recalls, he worked a lot of hours on it! Troll's Tale used the same "engine" as Al Lowe's first game, Dragon's Keep and was later used for Winnie the Pooh in the Hundred Acre Wood. Troll's Tale was first developed for the Apple II in 1983, then converted to Atari 8-bit, commodore 64 and the PC Booter in 1984.